Peter Bonnell is the Senior Curator at QUAD, Derby. He has an MA in Contemporary Curating from the Royal College of Art and before taking up his position QUAD in 2012 was Exhibitions and Education Officer and then Curator at ArtSway, which was a small gallery based in the New Forest. You can follow Peter on Twitter. What’s happening behind the scenes at the moment at QUAD? I work within QUAD’s busy programme team, which is part of a much wider QUAD team, that focuses on and delivers a huge array of activities around the building and off-site, all year-round. QUAD closes only for Christmas day and New Year’s Day; there is a constant hum of creative energy as we plan forthcoming exhibitions, festivals, screenings, talks and unique one-off events. For example, with sterling work by our cinema team, we have recently produced the Derby Film Festival, featuring mainstream and niche films, with a keynote talk by the one and only Toyah Wilcox; previous festivals have welcomed Brian Blessed, Sir Ben Kingsley and QUAD’s founding patron, the late Sir John Hurt. QUAD also hosted a series of talks for Derby Book Festival, and we’ll soon be part of the city-wide team delivering Derby Festé. Truly it can be said that Derby is a city of festivals! But within the programme team, one of the main activities we have been working on since the turn of the year is FORMAT International Photography Festival off year programme. The main FORMAT biennale will take place in 2019 and planning is already at fever-pitch for that, but the off year programme also features a wide selection of exhibitions, talks and the UK’s largest portfolio review. This year is also QUAD’s 10th anniversary and we are planning a range of events to celebrate, including a re-showing of Bill Drummond’s iconic ‘The 17’ project in QUAD’s Extra Gallery Spaces. Throughout our year-round exhibition programme we showcase artists from variety of media backgrounds, with a particular interest in photography, installation, moving image work and the use of digital and new media technologies. This year’s FORMAT off year programme is about to come to an end with the closing of Mark Neville’s exhibition ‘Battle Against Stigma’ in QUAD Gallery. 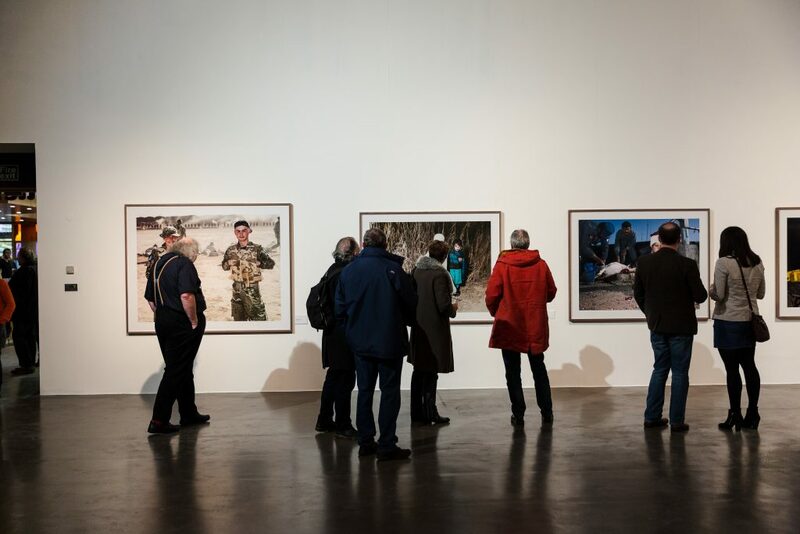 This is an exhibition encompassing photography, film works and printed emails and focuses on mental health issues in the military, and issues relating to displaced people – particularly young people – in zones of conflict. 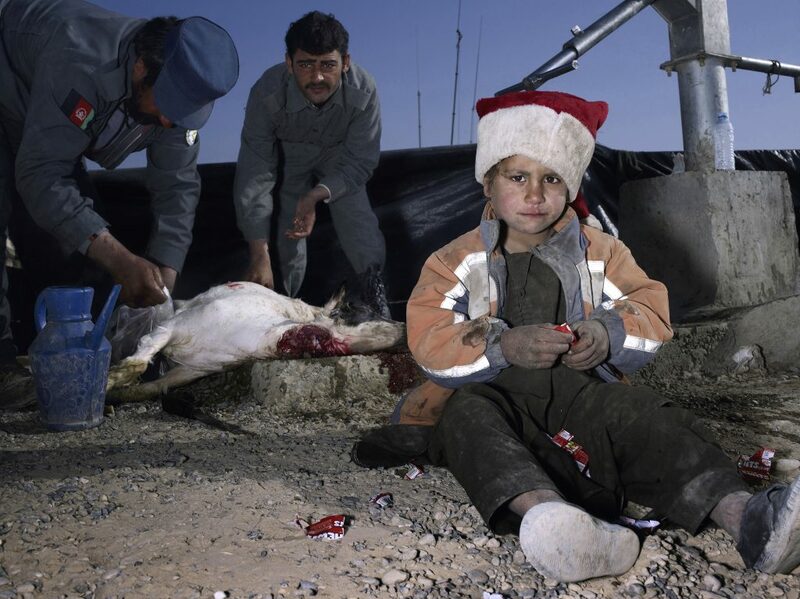 Mark was the official war artist sent to Helmand Province, Afghanistan in 2011 to shadow the British troops and to document the situation on the ground. On his return to the UK after three months in the Province, and with little support from the MOD, Mark was diagnosed with PTSD and it is this that has fueled his interest in highlighting mental health issues in the military. Also included in the exhibition are his images of the displaced in Ukraine, resulting in a deeply moving and emotionally raw series of images and films. FORMAT off year also included an off-site exhibition at Riverlights titled ‘Being / Seeing’ as part of the Parallel European Photography platform project – a massive Euro-wide initiative led by the organisation Procur.arte based in Lisbon, that sets out to provide a platform to support and commission emerging photographers and curators. We exhibited the work of seven artists – Glorija Lizde (Croatia), Mark McGuinness (Ireland), Sofia Okkonen (Finland), Toms Harjo (Latvia), Andrej Lamut (Slovenia); Charlotte Mano (France), and Ramona Güntert (Germany). The curator was Nikki Zoë Omes (Netherlands). 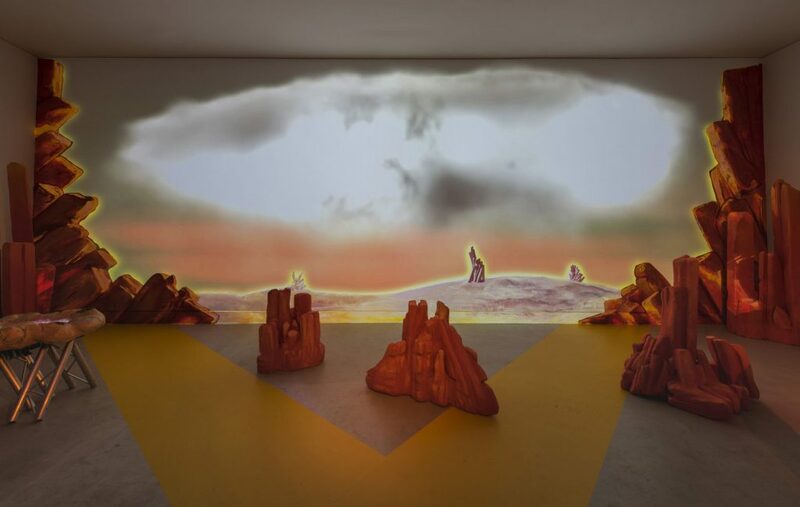 We’re also developing a major project by Nottingham and London-based artist Joey Holder (more of that, below), and are in the last two weeks of an Artificial Intelligence project titled ‘Let me be FRANK with you’ by the Danish artist Cecilie Waagner Falkenstrøm on display in our Extra Gallery Spaces. We recently hosted a week-long residency in our Artist Studio by the Bristol-based artist Megan Broadmeadow, along with her collaborators Cursor Video (Ed Metcalf & Jamie Shaw), where they worked with our Digital Technical Officer Darius Powell to develop new AR and VR works for her exhibition in QUAD Gallery in the summer of 2019. Megan’s project SEEK PRAY ADVANCE is produced in collaboration with CGP London and Green Man Festival. We are also very pleased to announce that in November we will present a season of VR and immersive artworks, including the first UK solo show, in QUAD Gallery, by the US artist Rebecca Allen who, in a recent Radio 4 documentary, was described as a ‘digital art pioneer’. For her show at QUAD Rebecca will exhibit recent and new VR works, as well as a selection of work from her stellar career – a career that began in the mid-1970s. Alongside Rebecca’s solo show we will also present a new VR installation commission by the Latvian artist Zane Zelmene. Zane will bring her practice to Derbyshire that will see her scan and document local historic landmarks. In addition, throughout QUAD Extra Gallery Spaces we will display interactive digital focused work by the Sheffield-based artist Leila Johnston.. Earlier in this article I went into detail regards Mark Neville’s current exhibition in QUAD Gallery, that sadly ends on Sunday 24th June (visitor comments have been universally praising of the relevance and importance of an exhibition that highlights mental health issues). We are deep into final preparation for our next exhibition – ‘Adcredo: The Deep Belief Network’ by Joey Holder – launching on the 13th of July, and open to the public on Saturday the 14th – that will see an enormous ecological installation appear in QUAD Gallery that will surely amaze all visitors (I’m trying to tease this out so that people will come to see it; it will be wonderful!) 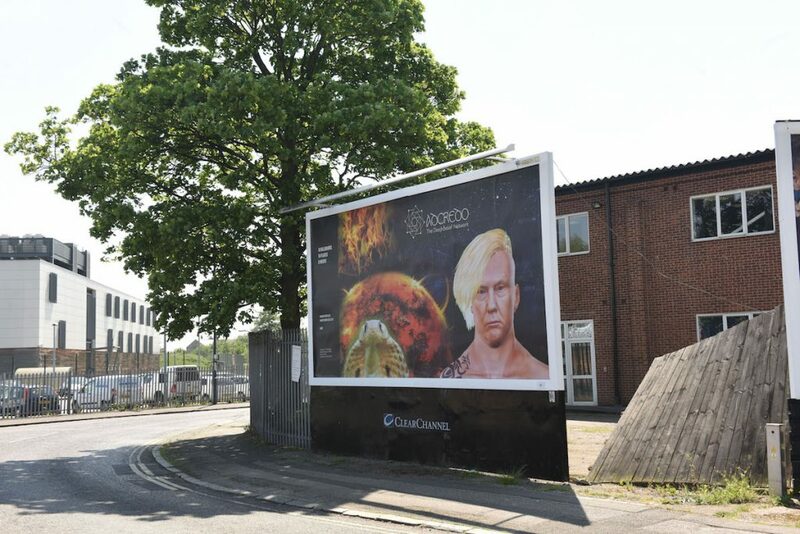 Those regular visitors to the CVAN-EM site will be very familiar with Joey’s work – as she is part of the ‘In Another Place’ project, with a massive image of Donald Trump scowling down from a billboard on London Road in Derby. Joey is an artist I have long admired, and it is fantastic that she calls our region home (although she also works around the UK, is based in London and is in huge demand internationally). Her work mixes elements of the digital – or, more precisely – the examination of how we use the digital – presented in highly detailed installations that envelope and immerse the viewer in deeply theoretical questions that on closer investigation speak to all of us. 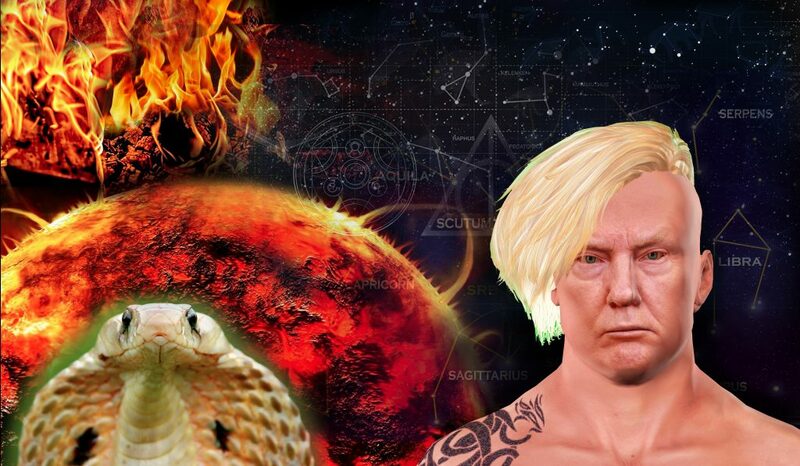 ‘Adcredo’ investigates the construction of belief in online networks, examining the rise of unjust ideologies and fantasies, and how these are capable of affecting our worldview. The advent of digital media has shown that the world is made up of a mass of circulating, disjointed and contradictory information. This multi-dimensional communications network can be easily manipulated by online groups and individuals, which can give rise to new narratives and ideologies. Using research from investigative journalism and social psychology the work takes the form of a speculative association, a corporation where ideologies are disseminated to manipulate people. Conspiracy theory, sci-fact and sci-fi, corporate and religious belief systems are woven together in this multi-dimensional work. I should also like to highlight an exhibition, as yet untitled, that we will be presenting in our Extra Gallery Spaces, curated and selected by QUAD’s Young Advocates, a group of creatively-minded 16-25-year old’s who collaboratively produce events with QUAD staff and artists. This exhibition is inspired by Joey Holder’s work and ideas, with a theme generated by the Advocates that posits the question, ‘The Internet: is it helping us, or hurting us?’ The artists for this exhibition will be selected from an open call. At QUAD we select artists in a variety of different ways, some of which I have alluded to elsewhere in this text. For example, the Young Advocates exhibition will be selected via an open call; there is also an international open call as part of each main FORMAT festival that is selected by a jury of outstanding photography professionals. As a curator I discover work by going to exhibitions, receiving recommendations from peers, though desktop research and reading in general, and being asked to collaborate on projects either by artists or other organisations. We also receive submissions via our website, and I meet many local and regional artists through regular monthly portfolio review sessions, and also our upcoming ‘Network’ peer support meetings. QUAD also runs a highly regraded Digital Artist Training programme for artists from across the region, with many alumni featuring in projects and exhibitions at QUAD. Mark Neville’s exhibition ‘Battle Against Stigma’ continues until Sunday the 24th June, as does Cecilie Waagner Falkenstrøm’s project in the Extra Gallery Spaces. Joey Holder’s exhibition launches on Friday the 13th of July (an auspicious date when you consider that her project examines belief systems!) and is open to the public from the 14th of July to Sunday the 21st of October. The Young Advocates exhibition in the Extra Gallery Spaces launches at the same time but ends on Sunday the 12th of July. 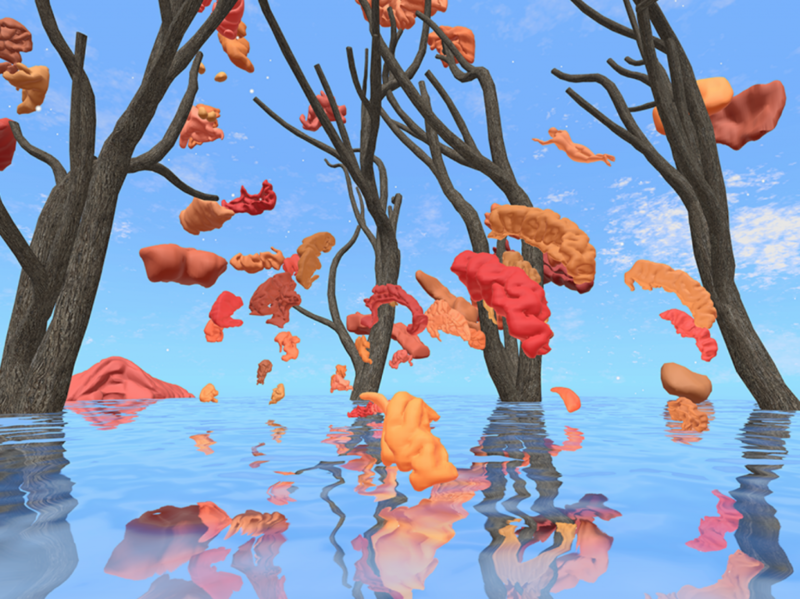 ‘The 17’ exhibition in the Extra Gallery Spaces will be open to the public from the 25th August to the 21st of October, and our VR season – featuring work by Rebecca Allen, Zane Zelmene and Leila Johnston – will launch on the 9th of November and be open to the public from the 10th of November to the 3rd of February 2019. 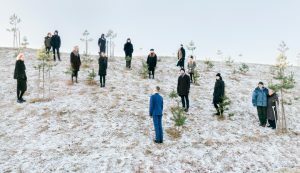 The main FORMAT International Photography Festival, appearing in venues across Derby, launches on the 14th of March and will run from the 15th of March to the 14th of April 2019. It’s difficult for me to choose from what is, we believe, a hugely exciting upcoming programme in our gallery spaces. However, I am extremely excited by the prospect of Joey Holder’s exhibition in QUAD Gallery – the planning stages suggest this is an exhibition that will resonate with our audiences, and that will create a relevant and vigorous debate about something many of us use on a daily basis: online systems and networks. I’m also thrilled that we will be working with the US-based artist Rebecca Allen. I met Rebecca at Wysing Arts Centre earlier this year, and to look at her career is to witness an artist who constantly challenged the boundaries of digital tools and how they can be harnessed to make art. The recent ‘In Another Place’ project by CVAN-EM is a great example of how organisations’ in the East Midlands region can and do work collaboratively, and I’d like to see even more collaboration among small and large organisations – particularly to help grow and nurture artists and emerging groups, and to share resources. 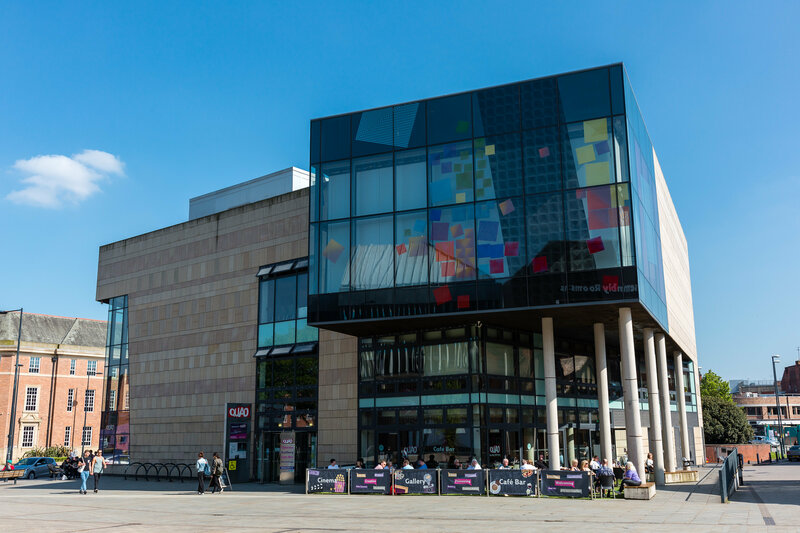 For more about Peter and QUAD, visit the website at www.derbyquad.co.uk for a comprehensive and constantly updated list of events, talks and educational activities as part of our exhibitions programme.